I bought these shoes on sale years ago--like, ten--and left them in my closet to age. They were too mannish to suit my taste at that point--I know, I know, if I didn't really like them, why did I buy them? 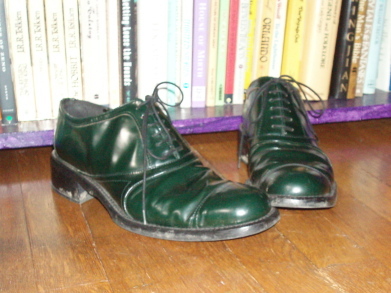 Well, I bought them because they were a super-duper bargain and because they are well made dark green Italian menswear Oxfords, and I knew, I just knew, some day they'd make me really, really happy. Sure enough, about two years ago, I pulled them off a top shelf, realized how awesome they are, and started wearing them with skirts. They are comfortable and a very pretty dark green--did I mention that they're green? Actually, to my eye, the thing is that it's purple! I love looking at other people's bookshelves. I wish I could read the spines on your books -- an intriguing photo. And I like that you left a bit of mud on the heels of the shoes...museum pieces to be used! "Will people notice the mud on the heels and soles and wonder why I didn't clean it off?" I am quite regular about polishing my shoes--I hate it when they look all scuffed--but shoes get dirty when you wear them outside. "Will people notice my strange purple bookshelf?" It was a bookshelf in my dad's office, made to accommodate law books, utilitarian and plain, and it just needed to be a great color. "Will people comment on the titles they recognize?" I guess you can't see many.... This particular bookshelf holds my collection of fiction, which is of course alphabetized. So you've got P through Z at the bottom. The Lord of the Rings is there, as are the collected works of Brady Udall (a Mormon writer from Arizona whom I've met--he's extremely nice--but whose work I've never read, though I keep meaning to, which is why I keep buying his books) and a bunch of novels by Virginia Woolf. Personally, the thing I like best about this photo is that it's modeled on a painting by Van Gogh, which I used to have a print of. He did a whole series of paintings of well-worn boots. I always liked them. Green shoes are ALWAYS a good idea. These are AWESOME. You have great taste in shoes. And books. Nice shoes. Comfort AND color. The best idea. And aren't men's shoes comfy? I dig those shoes too. Like you, I have shoes I bought 10 years ago that I still like to wear. It was a great day when my feet stopped growing. Funny, I read the collected works of Brady Udall this year: Letting Loose the Hounds and The Miracle Life of Edgar Mint. Are there others? I can warmly recommend both, although I prefered Letting Loose the Hounds to Edgar Mint. Holly, since Hounds is a collection of short stories, you ought to pick it up and read one or two. "Buckeye the Elder" was probably my favorite, although "Midnight Raid" and "He Becomes Deeply and Famously Drunk" were excellent as well. Glad you all liked the shoes. Matt, I've only got the two BU titles you mention, and I will read them one of these days, I will.... But right now I am so behind in my required reading that I don't have time for even a single extra short story. I like that the mannish green shoes you wear with skirts are displayed in front of the book, Orlando. Seems apt. This page contains a single entry by Holly published on September 19, 2006 12:16 AM. It's the Thought That Counts, Which Is Why These "Gentlemen" Can F**k Themselves with a 2X4 was the previous entry in this blog. More on the Religion Thing is the next entry in this blog.